Shortly after I moved into an off-campus apartment and started to cook for myself last August, my mother recommended I sign up for the Bon Appetit (BA) mailing list. I naively heeded her advice. Since then my inbox has been invaded by emails informing me of “51 Reasons to Use the Good Parmesan,” “How to Buy, Store and Shuck Oysters Like a Pro,” and “The Best Thing to Do With Your Heirloom Tomatoes.” I don’t know about you, but I buy Parmesan once a semester, and it’s the cheapest one they have at Stop&Shop, and I certainly have never wondered what to do with my imaginary heirloom tomatoes. A particularly vicious “empty-fridge” recipe once assumed that I keep dry-cured sausage, artichoke hearts, sun-dried tomatoes, pine nuts, and a jar of pepperoncini in my pantry. I don’t even have a pantry, let alone pepperoncini. For a while, I tried to run with the pack. Once I spent $36 at Elm City Market on three ingredients so that I could make “BA’s Best Pesto.” I refused to let my roommates have even a spoonful, too selfish to let $2.40 slide down their throats. BA was making me into a monster, until I decided to turn my back to the pack. I soon realized that you don’t need money to make food that seems fancy — only strategy. So next time you’re hosting a dinner party, don’t feel like you have to scan the internet for an extravagant recipe. Simply follow the directions below, where I show you that with a couple key ingredient deployments and a little BS, you too can say no to BA. The dish I’m going to be teaching you how to make is a warm asparagus salad, partly because calling something a “warm salad” is definitely something a rich person would do, but mostly because there is no vegetable posher than asparagus. Its name is literally Latin. The only vegetable posher than asparagus is aubergine, and that’s only if you call it aubergine, because when it’s just an eggplant it is definitely not posh. What’s more, the asparagus has serious elitist street cred. According to asparagus-lover.com, Emperor Augustus allegedly built a bunch of ships called the Asparagus Fleet to transport asparagus across the Roman Empire. And you thought the Mayflower was a big deal. 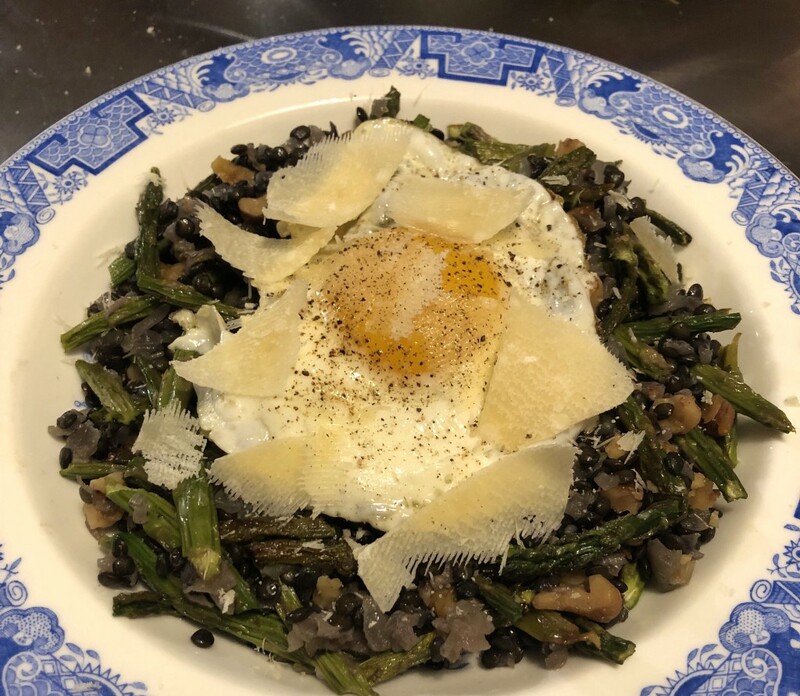 But while the asparagus, with their bright skin, slender legs, and feathery foliage, are the star of this bowl, the real base of this dish is the lentils. Make sure that you use black lentils, not because they taste better, but because you can call them “beluga lentils” to your guests, and later in the dinner you can throw in a casual “I don’t know if you know this but beluga is a type of caviar.” Consider your guests fooled. Finally, the cheese. Make sure you put lots of cheese on top, because nothing says “I’m loaded” like owning cheese, but do NOT grate it. Instead shave the cheese into big pieces, so it won’t dissolve into the lentils, maximizing your cheese-visibility. This is important because if your guests can’t see the cheese, they won’t think about how fancy you are for buying it. For this recipe, really any cheese works, as long as it sounds European enough that people think it’s fancy. I used a Bad Parmesan but described it as Parmigiano Reggiano. A nice $7 Stop&Shop Pecorino Romano would also do the trick. Oh and how could I forget the mushrooms? Second cousins to the revered truffle itself, with whom they have been on holiday like three times. And yeah, they actually talk a lot, and their parents are super good friends, so you could kinda say that the mushrooms are practically culinary royalty themselves…Yeah, you could definitely say that. TOAST NUTS: Spread out a 1/4 cup of pecan/walnut pieces over a baking sheet. Roast for 7–10 minutes at 350°F. Be sure to check up on them because, as I learnt with Tyler, the first boy who ever cheated on me, nuts burn surprisingly quickly! MAKE LENTILS: Rinse 1/4 cup black lentils and add them with 1 cup of vegetable broth to a pot. Bring to a boil, lower heat to a simmer, and cook for 15 minutes (or until desired consistency. I prefer mine with a bite, but maybe I’m just kinda wild like that). Drain. SAUTE ONIONS AND MUSHROOMS: In a separate large frying pan, heat a glug of olive oil and some butter over a medium flame. Once hot, add 1/2 an onion, finely diced, and sauté for about 5 minutes before adding 1 cup of mushrooms. Season and sauté for another ten minutes before adding to lentils. ROAST ASPARAGUS. Snap off the woody ends of 1 bunch of asparagus, trying to break them as close to the end as possible but where the stalk still naturally snaps. Cut them at a diagonal into roughly 2-inch pieces, spread out over a baking sheet and drizzle with olive oil and 1/2 teaspoon of salt. Massage oil into asparagus spears and roast at 450°F for 10 minutes. ASSEMBLE SALAD: Transfer lentil/mushroom mixture, asparagus and nuts to serving bowl, then shave as much European-sounding cheese as desired on top. BONUS VARIATION: If serving on individual plates, I recommend throwing a poached or fried egg on top and saying it’s a duck egg. Literally no one knows what a duck egg is meant to look like, but it sounds fancy af. Cooking Haute Cuisine When You’ve Got No Green was originally published in The Yale Herald on Medium, where people are continuing the conversation by highlighting and responding to this story.